BEIJING — China's sole aircraft carrier has returned home following a far-ranging three-week training mission during which its combat capabilities were closely scrutinized and speculation soared over what future role the flat-top will play amid China's growing military ambitions. The Defense Ministry said the 60,000-ton Liaoning sailed in to the eastern port of Qingdao on Friday along with its battle group that includes destroyers, frigates, a supply ship and anti-submarine craft. The ministry quoted the group's commander, Rear Adm. Chen Yueqi, as saying the drill simulated real combat as closely as possible and "achieved all targets set for it." 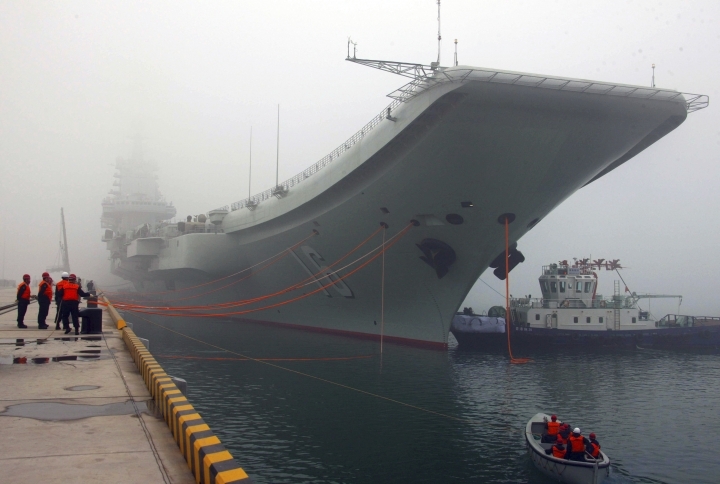 China commissioned the carrier in 2012 and declared it combat ready in November, shortly after which it launched its first live-fire exercises. The cruise that began on Christmas Day took it through the Miyako Strait, south of Okinawa, Japan, and then the Bashi Channel separating Taiwan from the Philippines as it entered the disputed South China Sea that China claims virtually in its entirety. It headed home through the Taiwan Strait in what was seen by many as a threatening message to the island's independence-leaning President Tsai Ing-wen. Taiwan's Defense Ministry said it was closely monitoring the passage but that there was no cause for alarm. China and Taiwan split amid civil war in 1949 and Beijing has vowed never to renounce its threat to use force to recover what it considers lost territory. Japanese and Taiwanese surveillance aircraft and ships closely monitored the Liaoning along its journey, seen by some as a sign of how China plans to use it to demonstrate its willingness to back up its territorial claims with military muscle. The Liaoning originated in 1990 as the unfinished Varyag for the now-defunct Soviet fleet. Purchased as a shell by China in 1998, it was towed from the Black Sea to the northeastern Chinese port of Dalian where it underwent an extensive overhaul of its hull, radar, electronics and other systems. Designated first as an experimental and training platform, the Liaoning represents a new degree of sophistication in the Chinese armed forces that includes ballistic missile submarines and prototype stealth fighters. It's also considered a blueprint for future Chinese carriers built using entirely domestic technology, at least one of which has been under construction since 2015. Yet, analysts point out major limitations in both the carrier's design and the Chinese navy's ability to utilize its full capabilities. Considerably smaller than the 100,000-ton U.S. Nimitz-class carriers, it can carry just 24 fixed-wing aircraft compared to 55 for the American flat-tops, according to a recent report by the Center for Strategic and International Studies. While the Liaoning's J-15 multirole fighters — a Chinese version of the Russian Su-33 — are highly capable, they lack the low-observable stealth technology of fifth-generation fighters such as the U.S. F-35C. CSIS also says the ship's Soviet steam turbine power plant was badly designed and poorly maintained, probably limiting it to a typical speed of around 20 knots. That is far slower than the Nimitz-class' 30 knots, meaning it would take longer to arrive at target and be less able to flee from threats. Its aircraft are also launched from a "ski jump" style deck rather than the powerful steam catapults that U.S. carriers use, requiring China's jets to use more fuel for takeoff and limiting them to smaller payloads. The Liaoning's pilots and crew are also far less experienced than their American counterparts, although they benefit from lessons learned by the U.S. and others in the decades since carriers entered operation, CSIS said. Other analysts point out that the Liaoning doesn't appear yet able to launch and recover aircraft at night, a crucial ingredient for combat effectiveness. The CSIS study concludes that those shortcomings make the Liaoning unsuited for "sustained, high-intensity combat operations," at least for now. That will likely restrict it to humanitarian aid and disaster relief operations, training and diplomatic missions and cruises in the South China Sea asserting Beijing's territorial claims. Despite that, the Liaoning "represents an important step in advancing China's ability to project naval power," the study said. "Regardless of the Liaoning's future abilities, the ship commands a degree of political utility as a tool of naval diplomacy through various operations, regional and global."